Q: How do I display captions and translations on a projector screen or extra display? Set up your computer to be connected to the projector. Ensure your screen display is set to “Extend” mode (learn how to do this on PC or Mac), rather than mirroring the display on the computer to the screen. Then, open up Google Chrome and log into spf.io. 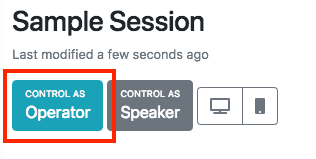 Find the session for your event and click “Control as Operator” to open the Interpreter view. Select the language(s) you wish to display on the projector. You can assign up to 3 languages on the same screen. If you want to overlay captions over slides, only assign one language. Click on the Formatting tab and make changes to the display until it is to your liking (i.e. change the font size, background color, etc.). Click “Fullscreen” in spf.io’s projector controls to make the projector view display fullscreen. Test run the output of slides/captions, by clicking on the slides/document lines in the Interpreter view. Confirm they are appearing on the projector screen as you expect. Clear the projector once you are done with the test run. You’re ready to display content on the screen!